If I decided to move to Los Angeles, I would live in the Chateau Marmont Hotel. This cultural monument overlooking Sunset Boulevard in West Hollywood has provided sanctuary for the famous and the infamous since it’s doors first opened in 1927. James Dead, Natalie Woods, and Sal Mineo first met at the Marmont, during a script rehearsal of “Rebel Without a Cause,” that iconic teen rebellion flick from the fifties. And when one of Dean’s heroes — Montgomery Clift — was almost killed in a 1956 car accident near her home, Elizabeth Taylor first saved his life by removing two of his teeth from his blocked windpipe and then brought him to the Chateau Marmont where he made his recovery in the penthouse. Not everyone was so lucky. F. Scott Fitzgerald suffered a heart attach at the Marmont and Jim Morrison of “The Doors” fame, hurt his back there while dangling from a drain pipe while attempting to swing from the roof into the window of his room. And, of course, in 1982 John Belushi famously died of an overdose in one the bungalows after injecting a “speedball” of heroin and cocaine. Then, in 2004 the famous photographer Helmut Newton crashed into a wall by the hotel driveway and died. Following her arrest for drunk driving in 2007, Lindsay Lohan moved into the hotel and stayed for two and a half years. 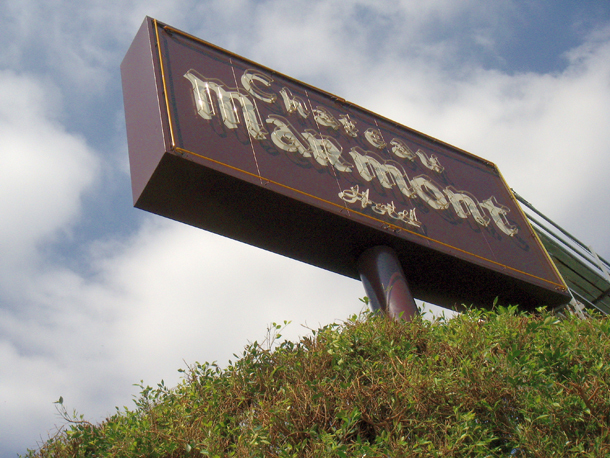 Led Zeppelin rode their motorcycles through the lobby to the sheers of guests, Judy Garland sang her heart out by that same lobby’s grand piano, and the Eagles classic “Hotel California” has long thought to have been written about Chateau Marmont.